Generally speaking, women's soccer cards don't normally carry a lot of widespread clout in the hobby. But not many soccer players are standouts on their national teams then go on to score a first-half hat trick in, arguably, the biggest game of their career. Fewer still see one of those goals come from midfield. 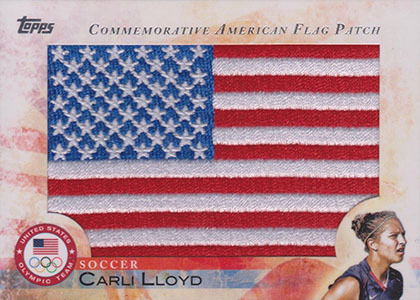 Welcome to the world of Carli Lloyd soccer cards, which shot up instantly thanks to her role in the U.S. Women's National Team's convincing victory against Japan in the 2015 Women's World Cup. And while the euphoria of that match won't last forever, it has linked the midfielder's name to soccer history. She's about as close to you get to being a household name in soccer, a sport that is showing some major signs of growth in North America. Lloyd also further cemented her big year with the 2015 FIFA Women's World Player of the Year as the top female soccer player. 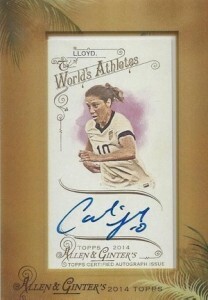 Like her teammates, collectors currently have a limited number of Carli Lloyd cards to choose from. And of those that are out there, the majority come from three sets: 2012 Panini Americana Heroes and Legends, 2012 Topps US Olympics and Olympic Team Hopefuls and 2014 Topps Allen & Ginter Baseball. Among these are several autographs. 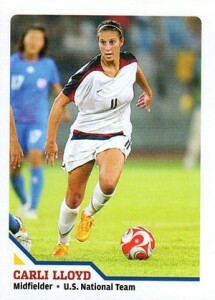 Below is a list of ten of the best and most important Carli Lloyd soccer cards. It's not a definitive list of all of her cards, but it does cover the most significant. Collectors should also be aware that there are several Carli Lloyd homemade cards that are not licensed or even recognized. Some of them look good, but if you're looking to buy any understand that they likely won't carry much secondary market interest. 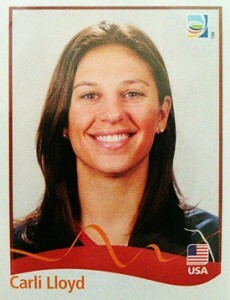 The first Carli Lloyd card didn't come in a pack. Rather it came as part of a sheet in the December, 2008 issue of Sports Illustrated for Kids magazine. Not only is it her first appearance in the hobby, but it beat everything else by several years. Although not a traditional trading card, it carries more significance than value. Because it was on a sheet, perforated edges are normal. But it's also important to check to see that the card was carefully separated. Given the overall lack of women's soccer cards and similar memorabilia, the 2011 Panini Women's World Cup Stickers have become an important release. This marked the first time Lloyd had something that could be found in pack form. 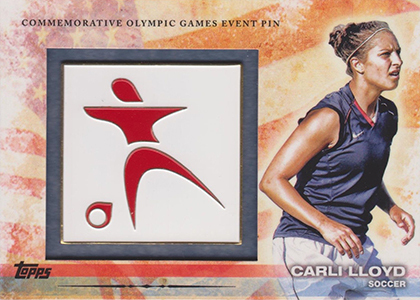 Not nearly as widely sold as the men's World Cup stickers, Carli Lloyd's sticker debut is quite tough to find now. 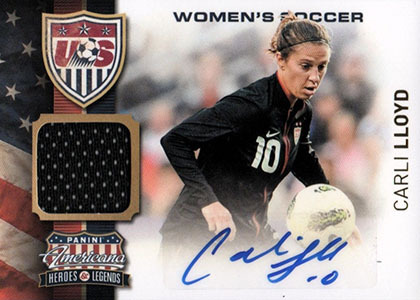 If you're looking to collect Carli Lloyd autographs (or signatures from many of her teammates), 2012 Panini Americana Heroes and Legends has several of them. Her Elite Signatures card, which is serial numbered to 179 copies, is essentially a parallel of the base card. The Elite Signature Materials version of the card adds a piece of memorabilia to the mix. And while it uses the same photo as the base card and autograph, it's done with a horizontal orientation that makes for something that looks a little different. The low production run of 49 numbered copies is a big selling point. 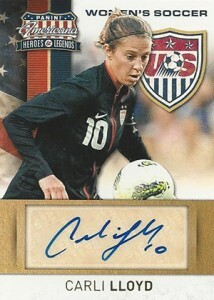 The US Women's Soccer Autographs come from the same packs but the look is significantly different. The color photo is the most noticeable when placed alongside the sepia base card and its premium parallels. A little bit rarer than the base autograph, this one is numbered to 159. 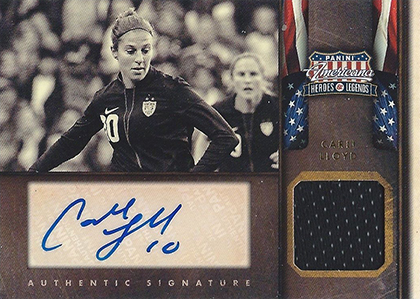 In case you haven't realized, 2012 Panini Americana Heroes and Legends is your best bet at finding a Carli Lloyd autograph in a pack. Held to 59 copies, this signed memorabilia card is one of the toughest in the product. Like all of the others, it uses a sticker to hold a signature. Both standouts for the US Women's National Team, Carli Lloyd and Megan Rapinoe have won both Olympic gold and a World Cup Championship together now. 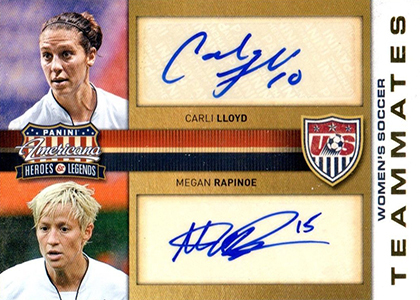 Their signatures paired together for this card make it an important one for women's soccer cards. 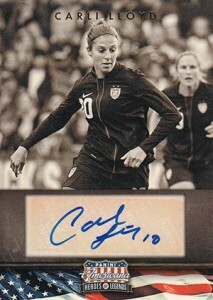 This card is for those who might not have the budget for a Carli Lloyd autograph card. A parallel in 2012 Topps US Olympic Team, the gold medallion matches the medal Lloyd and her teammates brought home from London. Besides the base version, there are Bronze and Silver parallels but those don't make a lot of sense now. Gold definitely does. Right off the bat, the flag patch in this card isn't a piece of game-used material. It doesn't come from a jersey Lloyd wore either. It's an embroidered patch embedded in the card and it looks pretty cool. Globally, pin trading is the most popular Olympic collectible. This manufactured relic combines to worlds. Like the flag patch card, it has a premium look and feel. As a result, prices are noticeably higher than if they were basic insert cards. It's also relatively tough to find. Although it came out a while after the various Panini Americana autographs, the 2014 Topps Allen & Ginter Carli Lloyd autograph has a couple of things that make it more appealing to some. The first is the on-card signature. There are no stickers here. Also, because of Allen & Ginter's popularity as a baseball set, it expands the collecting base looking to track it down. The card also has a Red Ink parallel that's limited to ten copies.